The BEST bootcamp routine in recent weeks! I know, this has been a long time coming. I keep saying I’ll post the workouts, and keep not doing it! Here’s my favorite one from the past month or so, I was sore as anything the next day and that is exactly what I look for from a workout. Before I post it, here’s a little intro: my class has been taking this format: we do two 8-minute traverse drills where there is one exercise to get from one line to another, and an exercise to complete when you arrive at the line (we’re outdoors on a turf field). 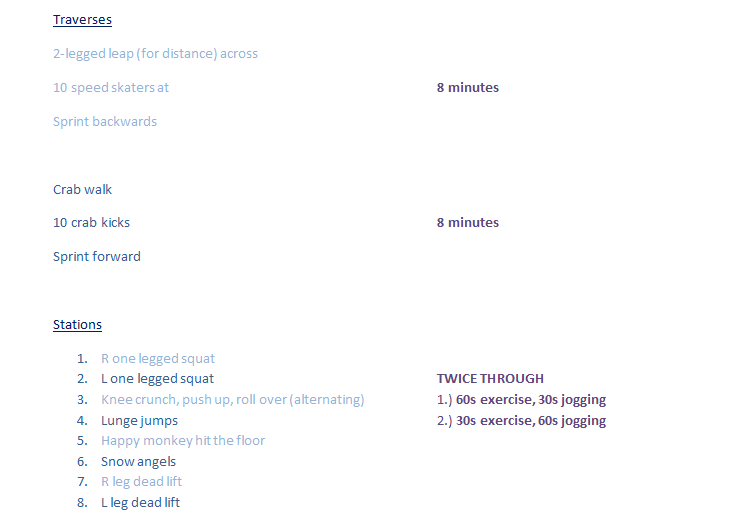 Afterwards, I set up a circuit with 8 stations with a different bodyweight exercise at each station. The first time through, we do the exercise for a minute and jog around the circle to get to the next station (30s). The second round, we do the exercise for 30 and jog twice around the circle for a minute. I’m convinced the awesome-ness is due to the two-legged jumps for distance. That explosive movement to get off the ground and a quick jerk of your legs to bring them in front of you to reach as far as possible really takes a lot of leg strength and core strength, and it’s an extremely intense cardiovascular experience as well. Love that! This entry was posted in Workouts and tagged at home workout, bodyweight exercises, bootcamp, circuit workout, group fitness, Reily Center. Bookmark the permalink.